Groupon's ad generated much controversy. The Packers might have been the official winners of Super Bowl XLV, but if we're counting Web buzz, there were plenty of other victors Sunday night. "Chrysler 200" scored as the top search in Google on Monday morning due largely to a gritty commercial featuring Eminem and his hit "Lose Yourself." Against the hard-driving beat of the song, a glistening new Chrysler 200 is seen. The vehicle is meant to replace the Chrysler Sebring midsize car, which was lambasted by critics. "What does a town that's been to hell and back know about the finer things in life?" a gritty voice asks about Detroit. "Well I'll tell ya, more than most. You see, it's the hottest fires that make the hardest steel. Add hard work and conviction and the know-how that runs generations deep in every last one of us. "That's who we are," the voice says. "That's our story." Cue Em, who himself has been in rehab. In the video, he walks into a theater where gospel singers are giving it a ton of heart. Message: The Motor City's woes are behind it. Another clever ad, for the Volkswagen Passat, has us fawning over "The Darth Vader Kid," 6-year-old Max Page, who was busy Monday doing the rounds on morning shows. Max has a congenital heart defect, and has a pacemaker, but his physicians say he's able to live a relatively normal life. He said he was "thrilled" to show off his "special move" in the ad. Speaking of special moves, fans appear to be torn over whether the Black Eyed Peas halftime show was banging or blah. The Peas, joined by Slash and Usher, sang their usual family-friendly hits, but Will.i.am tossed it up a bit and changed the lyrics to "Where Is the Love?" He rapped: "In America we need to get things straight/Obama let's get these kids educated/Create jobs so the country stays stimulated/This is dedicated to all the innovators." There is far less debate over whether Groupon offended with its ad about getting discounts on products and services. 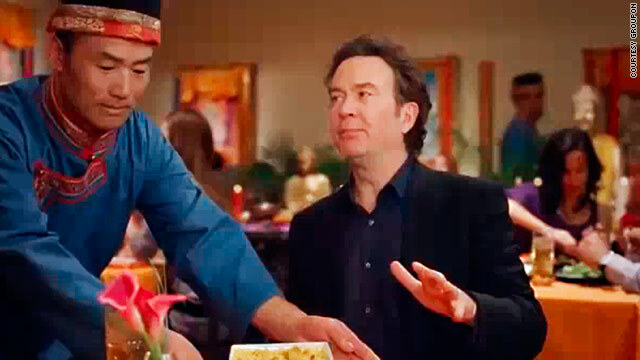 During the ad, actor Timothy Hutton appears to be served a meal at Himalayan Restaurant in Chicago. "The people of Tibet are in trouble. Their very culture is in jeopardy," he says, adding, "But they still whip up an amazing fish curry!" More viewers were probably munching on simpler dishes during the game ... like ... popcorn? Cameron Diaz was caught on camera feeding Yankees star Alex Rodriguez popcorn while they cozied up in a luxury box at Cowboys Stadium. Some people were disturbed, some enough to boo. Speaking of booing, you all know by now that Christina Aguilera messed up the national anthem. The pop diva has apologized, and here's proof she does know the words. Perhaps forgiveness will come easier after watching these wretched renditions from the past. Say what you will about Christina, at least she probably had a good seat. That's more than about 400 Super Bowl fans got. They were told they could not take the seats they'd paid for because their section of Cowboys Stadium was still under construction. No doubt those fans upon hearing that news had to dig deep, a theme that resonated during the games faithier moments. Even before kick off there was controversy over rejected ads from JesusHatesObama.com, a political novelty t-shirt company that had dueling bobble heads of Jesus and Obama, and the Fixed Point Foundation, a group that promotes Christianity in the public square. As Usher would sing "Oh my God..." or "Oh my gosh..."
I personally found the Groupon ad funny. Of course, I have a sense of humor. Stop adding those simpleton little tag lines onto other people's opinions "itsnottheendoftheworld", nobody is impressed with the ignorant one-liners. And yes... I know football...and I still say this game will NOT live in anyone's memory past next week AND yes... BEP and Christina were forgettable too! Bring back Prince (...never thought I'd say that)!!! LOL He performed in the pouring rain like a truly talented star!